With just three days left until Christmas, ASCAP (the American Society of Composers, Authors and Publishers) today reported that Luther Vandross’ recording of “Every Year, Every Christmas” was one of 2010’s most-played holiday songs on Urban radio! The song ranked at #5 on ASCAP’s list, based on airplay tracked from October 1st through December 19th this year. The song, released on Luther’s album “This Is Christmas,” was played 3,294 times. Read more at ASCAP.com. Luther Vandross recorded with many famous friends during his career, and one of them was Darlene Love, with whom he sang “I Listen To The Bells” on the album “This Is Christmas.” You can get into the holiday spirit by listening to the song below! 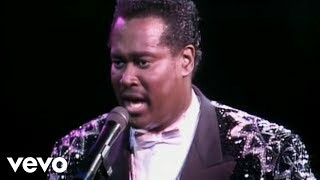 LutherVandross.com also congratulates the incomparable Ms. Love on her upcoming induction into the Rock and Roll Hall of Fame! She also will be appearing on the “Late Show With David Letterman” for her annual Christmas performance this Thursday, December 23rd. Happy holidays to you and yours! NPR’s “All Things Considered” has featured Luther Vandross in its series of “50 Great Voices,” noting that Luther’s “vocal instrument was supremely fine-tuned, controlled and yet effortless.” Their report also includes comments about Luther from friends and collaborators like Dionne Warwick and Marcus Miller. Dionne said, “When I heard Luther’s voice, I heard peace. It made me feel good.” You can listen to the broadcast below and read the accompanying article at NPR.org. The silky-voiced singer placed 36 hits on the R&B/Hip-Hop Songs chart, including 20 top 10s and six No. 1s, between 1985 and 2007. Sadly, his last two appearances followed his passing in 2005 at age 54. The key to Luther Vandross’ staying power was his ability to connect with younger audiences, courtesy of duets with Janet Jackson and Mariah Carey in the ’90s and Beyonce in 2004. Before he suffered a debilitating stroke in 2003, he recorded “Dance With My Father,” which he co-wrote with pop singer/songwriter Richard Marx. The touching ballad won the 2004 song of the year Grammy Award and Vandross’ album of the same name became his first to top the Billboard 200. You can read the complete list at Billboard.com.